The test was honestly not my focus of Heartland, but it still deserves a mention. We got 3rd in a class of probably 9 or 10, with a 67%. It could easily have broken 70%, but someone turned into a fire breathing dragon the second he realized we were showing, and we lost several accuracy points as a result. This down transition was supposed to happen at M, but happened a few feet late. My too-long reins and too far back elbows did not help here. When we were going around the outside of the ring, he started prancing, and also crow hopped and did a squeal/whinny combo. 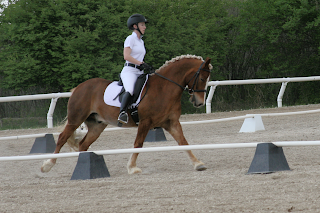 I don't mind his extra energy, which he often gets in the show ring, but I do need to learn how to channel it. I did a good job with that on Saturday in every part except the canter. We are so braced against each other here, although at least my body is forward instead of back, and it's just my arms contributing. (That's a partial position win compared to normal). 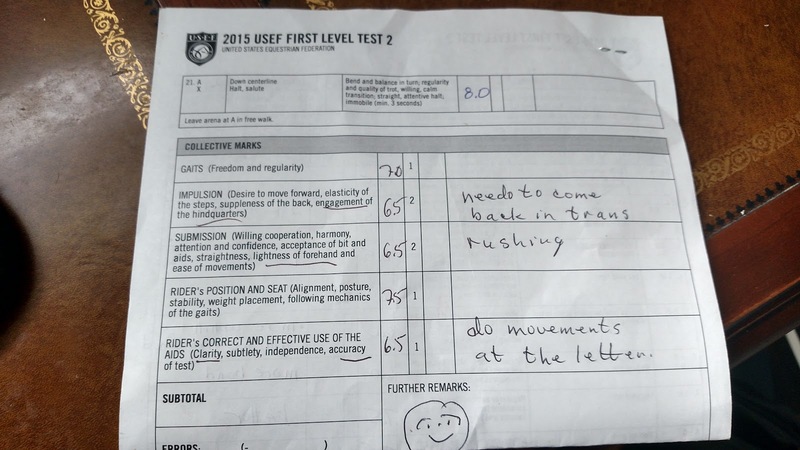 Our scores ranged from 5.5 (that late transition in the first picture) to 8.0's for the left lead canter and final halt. Our negative comments were things like "rushing", "hurried", "late". One time the "late" was because of pilot error, but two other times they were due to Connor being a challenging ride. I will take that 7.5 for rider position, thank you very much! 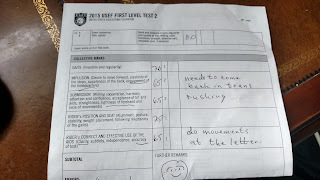 All in all, I was so happy with how the test went, I didn't care how we scored. Almost everything we got knocked for is pretty easily fixable or we've done better in the past, and I feel like the doors are opening to fix the rest now that my position is getting stronger and I'm more mentally present in tests. 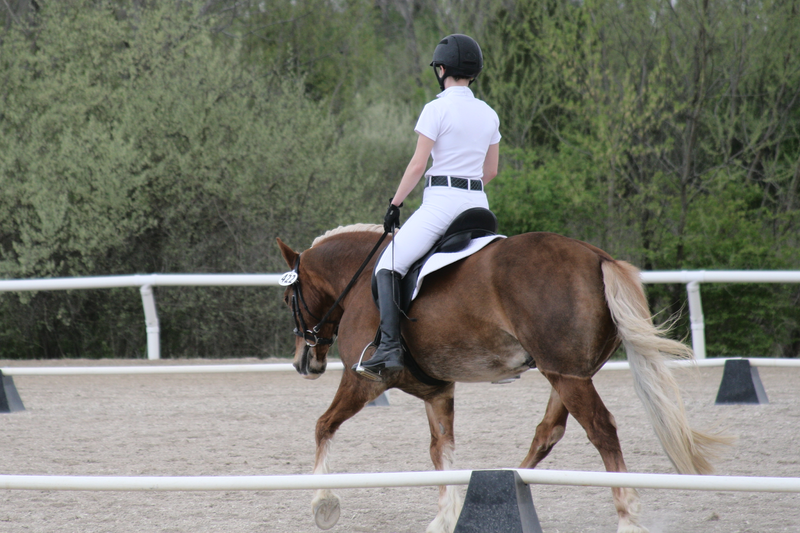 I mean, I actually remembered to shorten my reins multiple times in the test - that's huge! We still like the stretchy trot. 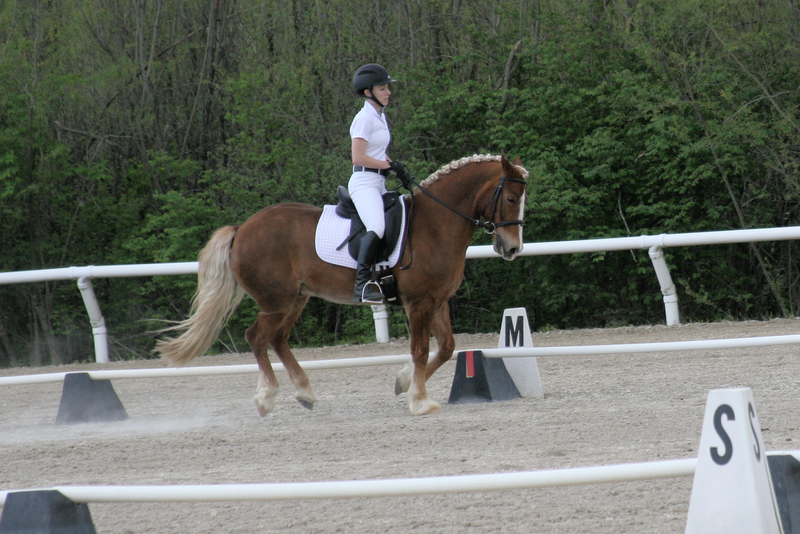 Also, my PRI pony pad shifted during the canter. Need to figure that one out. The biggest thing is going to be relaxing my position at the canter so that we can resolve the rushing issues. 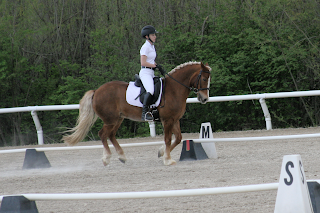 Controlling the canter is going to be key for us in the move to Second. So glad you had a productive first show! For the pad situation, I'm super impressed with how the Success Equestrian pad I bought stays in place. They're kinda pricy and I'm not sure how big they are, but might be worth looking into! Thanks for the recommendation! So far this is the only pad that's moved under the new saddle, and it's also the first time I've ridden in it, being a show pad. Hopefully I can figure it out, there aren't many pony sized Dressage pads out there! It's handy even at this level, if I can control it without pulling! He's so much easier to ride at shows than at home thanks to all that impulsion. Favorite quote of the day: my trainer's first words to me out of the ring were, "Well that was....active!" Great job Jen! Channeling the energy...definitely what I need to learn at shows with Ffergie. Looking forward to seeing you both at the May show! Well done! 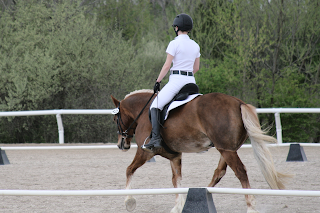 7.5 for rider is awesome :) Love where you mention being mentally present, Last month I finally rode a test for the first time like that and I feel like for me that was the biggest win of all!